Info: 4 BR, 4 BA beachfront condo with 2,110+/- s.f. 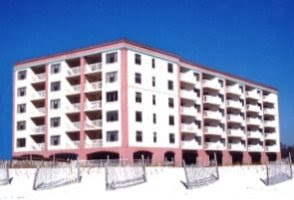 Situated on the emerald waters of Alabama’s Gulf Coast, Orange Beach has a subtropical climate and miles of white-sand beaches and access to the interior waterways north of the popular beaches. Visitors can also enjoy a lengthy list of other attractions including Adventure Island, deep-sea fishing, numerous area Golf Courses, the Alabama Gulf Coast Zoo, Waterville USA, The Wharf and more. Enjoy the many popular Orange Beach eateries like Voyagers, Cosmos’s, Ginny Lane, Louisiana Lagniappe, Cafe Grazie and more.